Almost every day there is an announcement about a new technological advancement. Whether it’s a new self-driving vehicle, solar roof panels, or continued breakthrough in artificial intelligence (AI), if you’re like me, you find ways to tap into these advancements to simplify your life whenever possible. I also ponder the advancements in my own industry and the rapid evolution of e-commerce, the technology behind it, and the community of sellers that makes up this exciting electronic platform. Often, early sellers will tell you that they got their start selling on Amazon.com or eBay because it was simple to get started and didn’t require things such as a dedicated website. Likewise, with the introduction of platforms such as Shopify, BigCommerce, and YoKart, anyone with access to a computer has the ability to publish their own storefront or website to list/sell their products through a series of simple wizards. While sellers now have almost unprecedented access to vehicles to maximize sales through these sales channels, it also creates a management dilemma: how to effectively manage the various sales across channels and distribution. All of these points converge in a need for a single solution, which I like to phrase “control tower”, where you can manage your business and have your finger on the proverbial pulse. If this is you, you’re in luck, as the available technology is mature, and the space for these software providers is quite crowded. 1. Multi-Channel Consolidation. At a minimum, the software solution must be able to manage your orders from all available sales channels into a single console. A robust solution will maintain the available inventory to sell against, push back inventory to the channel if necessary, and should allow for new channel configuration. More sophisticated solutions will also allow for certain listing configuration back to the various sales channels by product and availability. 2. Order Management and Orchestration. One of the most crucial elements to the seller’s success is not only managing the consumer experience, but also maintaining the regulations and compliance required by the sales channel. The right solution must be able to support the downloading of orders and evaluation of orders by attributes such as delivery destination, expected delivery, order value, product, etc. These attributes will drive further downstream decisions such as which carriers can meet the expected delivery of the order, which location to ship from, or whether a seller needs to hold the order for fraud verification if over a certain value or product type. Solutions able to scale with the growth of your business will also support integrations to 3PL or larger fulfillment providers, and automatically release orders for fulfillment based upon rules/settings. 3. Shipping Execution. 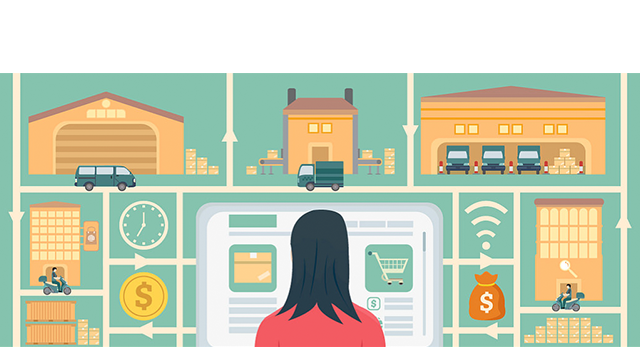 What’s e-commerce without logistics? If the software provider does not support the major carriers in your respective country or region, then it should not be on your list. Multi-carrier support is probably the most critical component of your platform, as it not only facilitates the delivery execution (such as validating shipping eligibility, carrier selection by cost or transit, generating carrier-compliant labels, printing labels, and uploading the confirmation of shipping back to the sales channel) for your orders, but it typically represents the largest segment of your operating costs. The abundance of carriers also provides the seller flexibility to scale with the right carrier across trade lanes, locally or globally. Everyone likes choices, so make sure the software you select has the options you need, or is able to add the carrier/service if not currently available. 4. Consumer Experience (CX). The right tools will also help manage your WISMO (“where is my order”) calls and inquiries through order and shipping history management. Every step in an order’s life cycle (from order created, order received, order fulfilled, to order shipped by carrier and assigned tracking number, package in transit, package delivered) should be visible in the solution, which can be used as a talk track to manage the customer expectation. 5. Reporting (Business Intelligence). Information helps in making decisions. Ensure the solution you select has the right KPIs necessary and relevant to manage your business. Don’t get lost in fancy dashboard widgets that animate or display nice graphs, but rather evaluate a solution on the effectiveness of the information provided. Whether you track your year-over-year sales, top products by SKU (by sales channel or even destination), carrier performance by month, carrier spend by month, etc., the tool must provide a timely overall snapshot across your business.